Migos's Yung Rich Nation is officially out Friday—you can listen to it now—so two of the group's three members stopped by ESPN's Highly Questionable for an interview. (The third member, Offset, is currently incarcerated.) Quavo and Takeoff talked about how they blow off steam by sparring with boxing gloves, the way they now "move like Obama" after a shooting in Miami, and shutting down 6 Flags "like Tom Cruise." The juiciest information from the duo related to their famous appearance in a Vice documentary where they were toting automatic weapons. "We still live in that country club," Quavo said, "but it was a movie, so they put us in that house... it was roll-playing." "We do record out of our closet," he added. 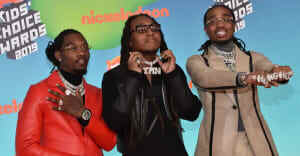 Takeoff continued, "They gave us a script, they gave me a script, I played it well, cause y'all think it was real. It was a spoof." When asked about all the guns in the Vice clip, all Quavo would say was, "Y'all trying to get us in a pickle." Read FADER's Migos cover story, and watch Rae Sremmurd's Highly Questionable appearance.